Simple. Quick. Chocolatey. Kid-pleasing. Mindy Classics. Every one needs the oh-no I don’t have dessert and Shabbat is starting in an hour recipe. Brownies can be done in a mixer, though when you are in a hurry, you want something the requires pretty much just a big bowl and a spoon. 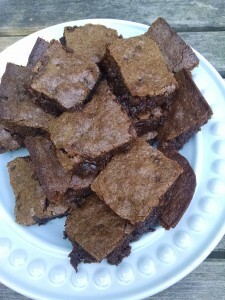 My go to is this one bowl brownie recipe I found on the internet years ago on a website written by a retired Mormon policeman TF Stern in Houston Texas. 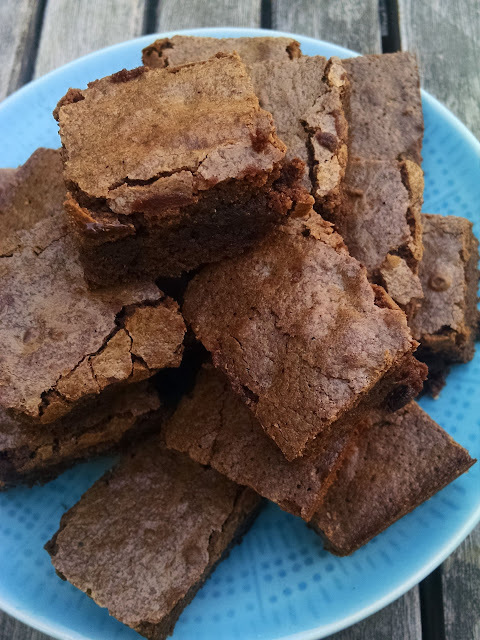 When I lost the recipe once, I simply plugged in 5 eggs parve brownies and up popped the same recipe on the About Food – Kosher blog. http://kosherfood.about.com/od/desserts/r/brownies_gooey.htm I do not usually modify the recipe – though I have added nuts and once tried crushed hard peppermint candy (I didn’t like it). Two of our children are living in Israel. I am anxious, though I know they are where they need to be. Our daughter is in Jerusalem. Our son is living on a kibbutz in the north awaiting his army placement. He asked me a few weeks ago for some recipes. I keep playing with this blog – writing, sometimes posting, thinking about what I want it to be and rarely moving past the resistance to make this me. So, today I start and I start with something basic, something easy, something those of you who know me will know as a Mindy classic dessert – brownies. I usually like to experiment with different ingredients, but part of the joy of this recipe is its simplicity. Instead, I decided to experiment with the process. My aim was for a gooey brownie that I could still cut and serve. I made three batches of the brownies. For the first batch, I beat the eggs and oil together until they were well mixed and a bit fluffy and then added the dry ingredients. For the second batch, I added the ingredients as they were listed in the recipe only mixing everything at the end. In both cases, I added the chocolate chips after I had mixed everything. With the third batch, I put the dry ingredients in the bowl, and mixed the liquid ingredients in a large measuring cup. I then added the liquid mixture to the bowl. Using a large measuring cup allowed me to keep the number of dirty dishes the same in each process. In all cases, I stuck to one mixing bowl, a glass measuring cup, dry measuring cups and spoons. I also let the eggs sit out for 30 minutes to warm up a little. I baked them for 25 minutes in my oven using the convection setting. W hen you mix the eggs and oil first and then add the dry ingredients, you get a lighter batter with more air bubbles. The brownie was more cakey at the ends, and only a little gooey in the middle. It was the driest of all the batches. With the second batch, I put the ingredients in the bowl in order. From start to putting the batch in the oven was around 10 minutes, though I did let the eggs sit out for 30 minutes. 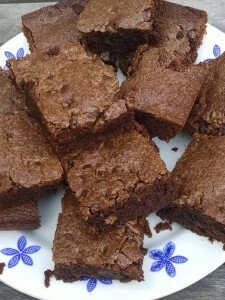 These brownies were incredibly gooey and may have benefited from more time in the oven. Super gooey brownies are best served warm, right out of the oven. This batch was supposed to be the dessert for a Shabbat meal I am making for friends but most of the brownies needed to be eaten with a spoon, so I decided to try one more time. This time I combined the two processes. In the big bowl, I put all the dry ingredients. Next I put the oil in a four cup measuring cup, then added the eggs and beat the oil and eggs together. I added the vanilla to the egg/oil mix. Then I added this mixture to the dry ingredients. Of course, I almost forgot to add the chocolate chips, with the last batch, so I added them to the top. 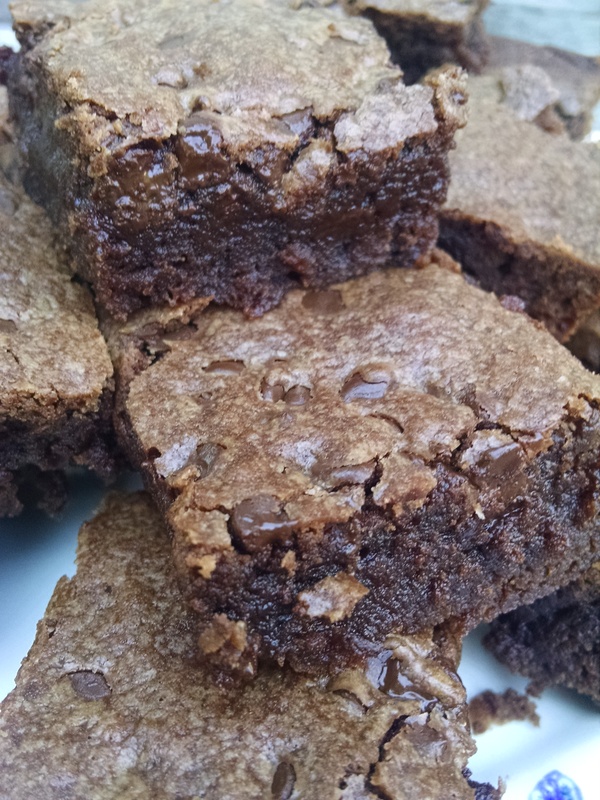 This method produced the Goldilocks of brownies – not too dry and not too gooey, though they were closer to the gooey side than the dry side. These are the brownies going to our friends so I better pack them up before they get eaten! Resources: My favorite parve chocolate chips are Chocolate Dream semi-sweet baking chips by the Hain Celestial Group. I also like the Enjoy Life semi-sweet chocolate mini-chips. Both a parve and vegan. The Enjoy Life chips are also soy free. Preheat oven to 350 degrees. Grease a 9 x 13 inch baking pan. The original recipe basically says combine all the ingredients in one bowl, pour into the pan and then bake for 30 minutes or until a toothpick comes out clean. For a drier brownie, beat the eggs and oil in the bowl and then add the dry ingredients. For a more gooey, but not super gooey brownie – put the dry ingredients in the bowl and mix the oil and eggs together in a separate measuring cup/bowl, then add the wet ingredients to the dry ingredients.